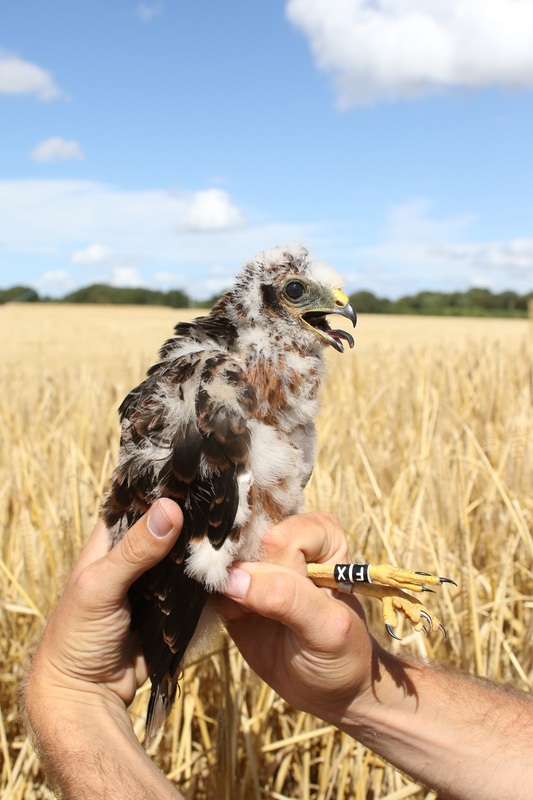 During the 2017 breeding season five Montagu’s harrier pairs were located; four were successful and produced a total of 12 fledged youngsters. The fifth pair nested (SW England) but failed after the un-tagged male disappeared for unknown reasons. One of the nests was a relay, as the first clutch was predated whilst at egg stage. One pair was in Norfolk with four pairs elsewhere in England. Sally, the satellite-tagged Norfolk adult female, which was featured on BBC Winterwatch vanished in questionable circumstances recently - read our blog here. Once hatched all four nests were fenced to stop predators and enable farming operations to continue without any accidental damage. Harvesting successfully took place at all four sites before any of the juveniles were flying. 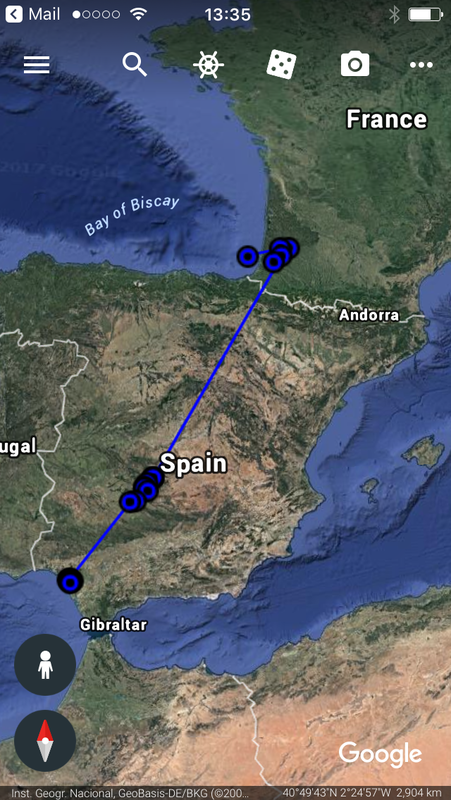 'FX' ringed in SW England on 20/7 and photographed in Holland on 21/8 - amazing ! Four birds previously satellite tagged in England returned to breed including Mark (2014), Roger (2015), Beatrice (2016) and Sally (2016). 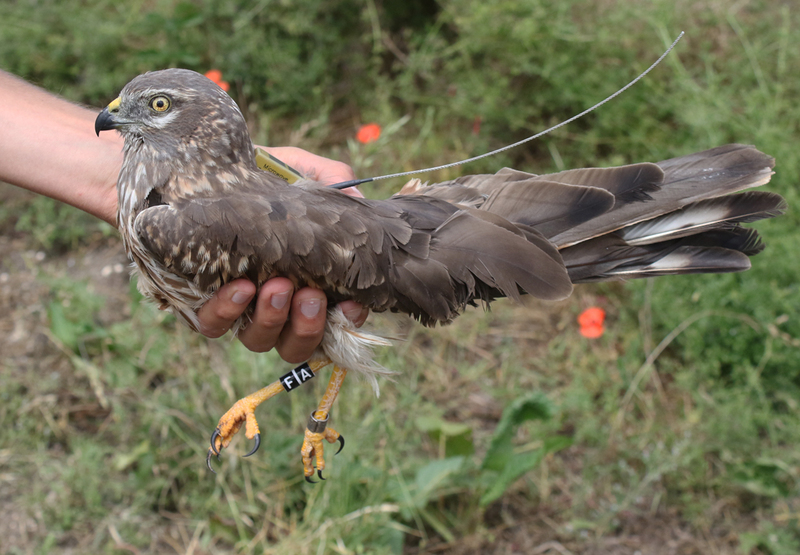 Mark is the longest standing harrier that we have tagged and it was frustrating this year that the aerial from his tag came off, affecting his signals but not his ability to father four more juveniles. 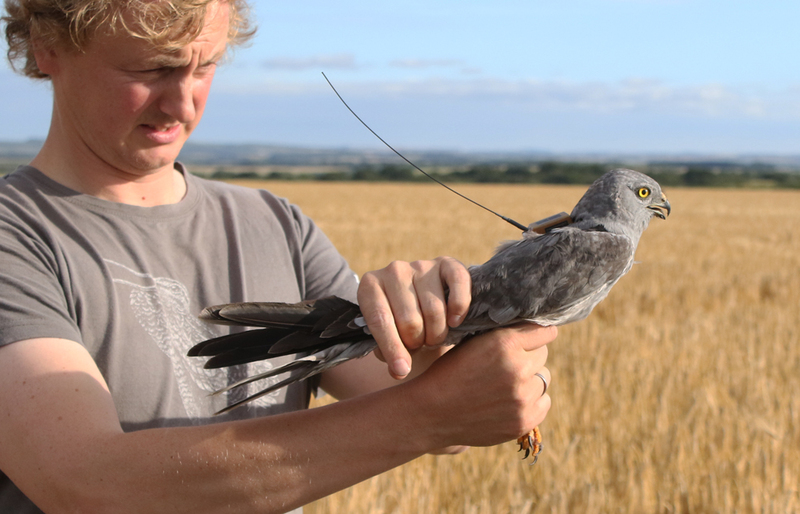 In partnership with the Dutch Montagu’s Harrier Foundation three new adult birds were satellite tagged, males James and John and female Ruth, this work was again kindly sponsored by The Sound Approach. The undoubted highlight of the year was the catching of two new adult female birds - Ruth and ‘GL’. Both were found to be wearing BTO metal rings and incredibly are sisters from the same brood of chicks ringed in Dorset in 2004! - when they were filmed being ringed by Chris Packham as part of a BBC Inside Out TV programme!. Ruth hadn’t been specifically seen since 2004 but we know that ‘GL’ had toured around southern England for a few summers, had attempted to nest on the Humber in 2015 and has been breeding successfully in SW England for the past two summers! These are sensational harriers and if wintering in Senegal then they will have each flown around 65,000 miles on migration alone ! Ruth - a 13 year old adult female ! This really is a watershed moment - proven UK born juveniles returning to breed and surviving 13 years. Not only have both of these birds set a new UK longevity record but together with the fact that all of our returning satellite-tagged adults have returned to their previous years breeding sites this shows we have a defined UK population which requires continuing conservation effort. 'Put simply, excluding new recruits, ringing and tagging has proven that we only have ten returning adult Montagu's Harriers left in the UK population and the continuing survival of these birds and their juveniles is essential'. In trying to understand how we increase the UK population we now have to solve the final piece of the jigsaw - what happens to the bulk of our fledged juveniles? where do they winter? when do they return back to breed ? how many die ? where ? when? and why? We will be working on this next year! In the meantime you can follow the latest news of the adult birds on migration at UKmontagus on twitter, we will provide daily updates once the birds have left the UK. Finally, a massive thank you! to the volunteers, staff, farmers, Sound Approach and Dutch Montagu's Harrier Foundation - without you this would not be impossible. Hi Mark - I am part of a montagu's harrier conservation project in Italy. We operate a similar nest protection programme as you do. I would like to make contact to learn whether there have been any trials to encourage them to nest in habitats less prone to danger. Very Well done RSPB in this vital work to keep the Montague's Harrier as a breeding bird in this country.